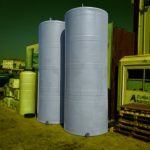 Fiberglass acid storage tanks have wide product range. 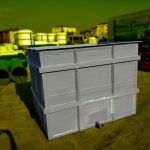 Fiberglass tanks can be used for various acid types in specific concentration rates and tempatures. You can have a look at resistance table. View Table. 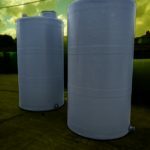 Fiberglass tanks are used for various acid types. 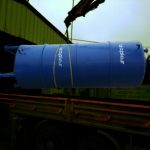 Tanks can be produced as silo type, cylindrical, prismatic and pool type. You can see some product examples that are produced for different companies. 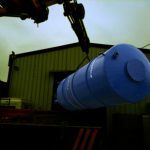 Tank dimensions can be changed according to projects. 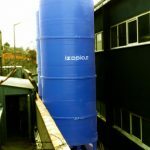 20m3 fiberglass acid storage tank is produced for ILVE Kimya. 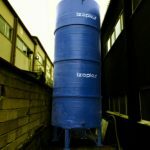 Tank is produced as silo type. 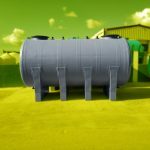 Tank legs are dn150 iron pipe. And they are welded to tank with dn80 iron pipes. 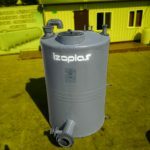 Tank body has 2 pcs. supporters. Supporters are dn100 U-Profile. 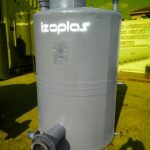 Tanks are manafactured for KOLIN INSAAT company. 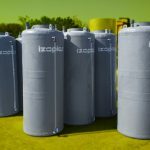 Tanks will be used for Hydrochloric Acid storage. Tanks height is increased according to project. Tank main legs are frp but their heights are increased to 500mm according to project. 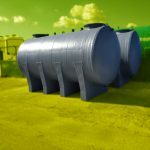 25m3 Fiberglass acid storage tanks are produced for EURO KIMYA. 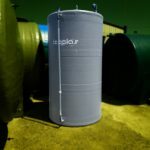 Tanks are produced as vertical cylindrical and raised with metal legs. Tanks have 4 pcs. metal legs at the bottom. These legs’ heights are 700mm. 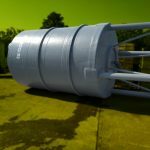 Tanks metal legs are supported with dn80 metal pipes and supporters are welded to tank. Also there are 3pcs. dn80 u-profile supporters on body of tank. Supporters are coated with FRP. 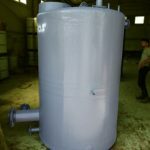 Tanks are produced for Doktor Tarsa Company. 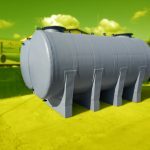 Tanks are vertical and have standart equipments. 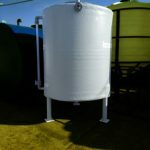 Flat bottom side of tank is able to be installed on concrete ground. 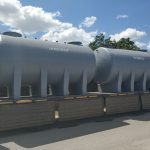 Tanks bottom side is flat. 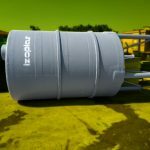 You can install your tank directly on to concrete ground. Dimensions can be changed according to your project. 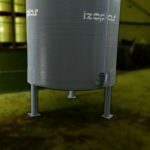 Tank is produced as vertical and raised up with metal legs. You can see resistance table for caustic acid at below. Tank’ legs are dn80 metal pipe. Tank has 3 pcs. legs at the bottom. 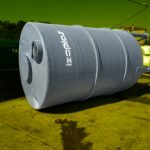 Tank is produced for Mono Aritma Company. 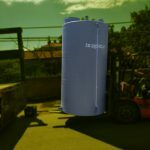 It is a standart vertical tank. 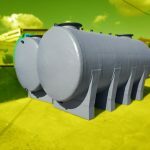 All equipments preffered and placed on tank according to company’ project. 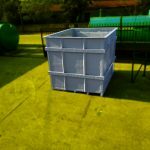 Tank’ bottom side is flat and you can install tank directly on to concrete ground. 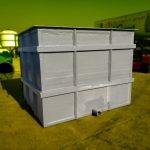 Overflow pools are used for storage of waste acids. Top side of tank is completely open. 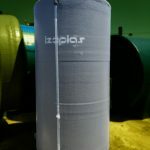 Tank is produced as sloped toward to outlet flange. Overflow chemical pools are produced onto a metal construction. 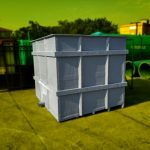 Metal construction is coated with FRP and not contact with chemical that will be filled. 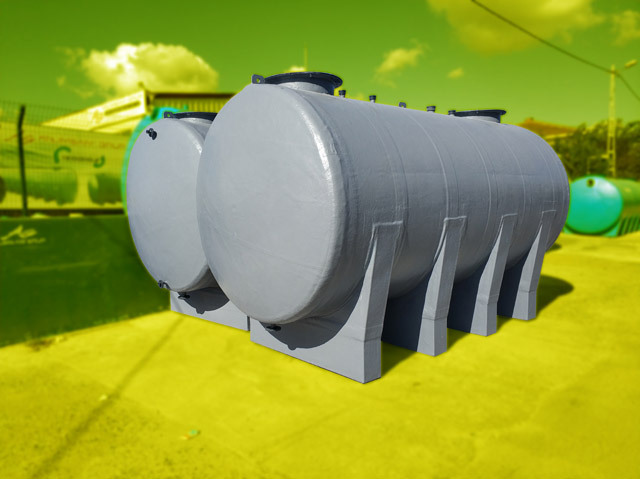 We can supply acid storage tanks for different projects with fiberglass wide product range. You can see different product projects in different dimensions that are produced for TEKKIM Company. Tank’ legs are dn80 metal pipe. 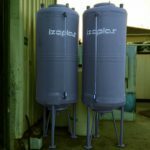 They are supported with dn25 metal pipe to tank.